Melondipity.com has the largest assortment of baby hats anywhere on the Internet, and hats are the best accessories to style up your newborn, infant or toddler boys or girls. Hats make your child look adorable and unique, but can also help with keeping newborn baby’s head warm and protecting from harmful sun rays. So, if you are looking for the best collection of cute and uniquely designed baby hats, then Melondipity is the right place for you. It is a one-stop destination for new mothers who want to stylishly and smartly accessorize their babies and kids. 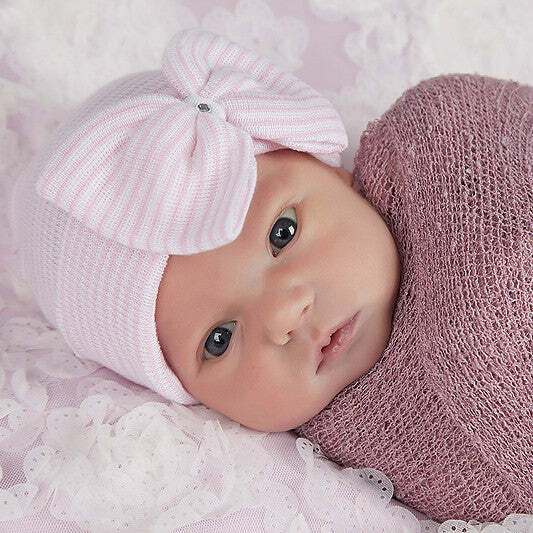 We offer an array of baby hats of various colors, designs and styles for both boys and girls. These are smartly-crafted headwear that can be worn by your child anytime and to any occasion. To make your child feel extra comfortable and relaxed, breathable 100% cotton has been used in the manufacturing of most of these hats. Our hats are handpicked by the design team behind Melondipity, and range from beanie hats, flower hats, sun hats, cuddly animal hats to headbands and warm ear flap hats. Could not have been better designed or manufactured! Love it on my great-grandson Monkee Boyee!! He LOVES red pom on top! I love it and get so many people asking where I got it!! My daughter is now the the girl with the fabulous baby hats!!!!!! I love love love it!!!! My daughter was born a preemie just 3 days ago and the hat fit perfect from the moment she was born! So happy with my order! Cannot wait to buy more hats like this for my princess! I ordered this hat to take my little guy to D.C. this fall. They shipped it to me on the day I ordered it and could not love it more! It is the cutest thing that I have ever seen on my little guy and that is saying a lot!! My daughter looks sensational in this baby hat!! I've taken so many pictures of her in it and everyone that see's this hat wonders where I bought it from!! ... Other hats out there are not made using the same quality... definitely worth the money! These baby hats are adorable! They are very soft and fit the children head well. I bought this hat and the Pooch hat for a friends twins. She loved them! Gift for my niece and looks adorable on her and have received many compliments. Everyone wants to know where I got it. Loved it so much I ordered another hat for friend's baby. Great customer service too!